First impressions matter. 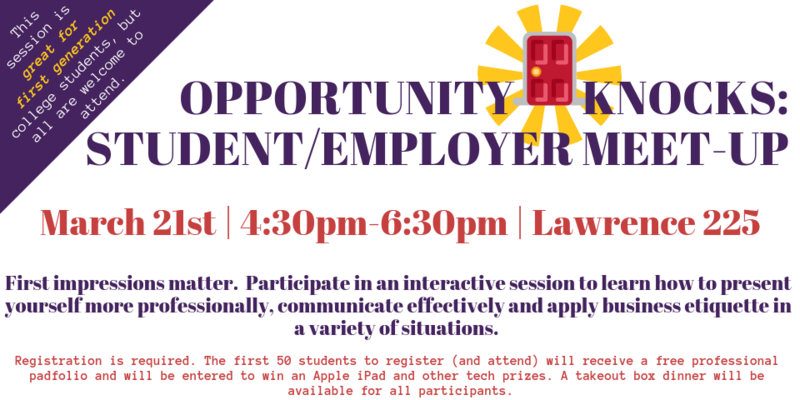 Participate in an interactive session to learn how to present yourself more professionally, communicate effectively and apply business etiquette in a variety of situations. This session is great for first generation college students, but all are welcome to attend. This event will also feature the opportunity to chat with the following employers: Wells Fargo, Vertex, Accenture, Aqua, Enterprise Holdings, Independence Blue Cross, Lincoln Financial, Merakey, Penn Mutual, Safeguard, SolomonEdwards, TD Bank, Tozour Energy Systems, USLI and Vanguard. Registration is required. The first 50 students to register (and attend) will receive a free professional padfolio and will be entered to win an Apple iPad and other tech prizes. A takeout box dinner will be available for all participants. - Have your information shared with participating companies and organizations. - Give permission to the Main Line Chamber to take and use your photo for promotional material.